The San Francisco 49ers travel to Los Angeles to take on the Chargers at the L.A Memorial Coliseum in a matchup featuring two teams with identical 1-2 records and coming off road losses. The 49ers last week lost to the Kansas City Chiefs 39-27, while the Chargers lost to the Rams 35-23. San Francisco comes into this game with a banged-up secondary missing, among others, Richard Sherman. Phillip Rivers, who’s thrown eight touchdowns and just one interception this season, will be looking to take advantage of that to win this game. Keenan Allen and Mike Williams, who last week caught 11 passes for three touchdowns and 189 yards are two wide receivers that could have a field day against the porous Niners pass defense. 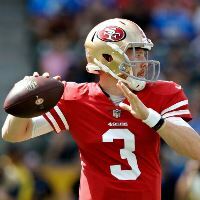 The Niners are also badly wounded on offense after losing starting quarterback Jimmy Garoppolo to a torn ACL that will keep him out for the rest of the season. It’s up to C.J. Beathard to try to save a season with very high expectations. Look for the Chargers to win this football game simply because they are going to overwhelm a San Francisco team that is dealing with way too many important injuries right now. Not only will Rivers dissect them through the air but look for Melvin Gordon and the rest of the Chargers offense to have a very productive day against a 49ers defense that ranks 26th in points allowed. In fact, Melvin Gordon, who already has two scores this year, could have his best game of the season this week as he can be expected to top the 100-yard barrier this week and score at least one touchdown. Look for him to break for a big play at some point in this contest. To make things worse the Niners will be facing one of the league’s best and more dynamic defenses with a new quarterback taking over the starting role.